. : New super mario bros :. 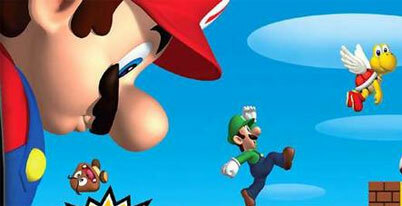 Home / Nintendo DS game manuals / New super mario bros :. New super mario bros manual Just click to open it in a new window then print the manual. New Super Mario Bros. was inspired by the original Super Mario Bros. (SMB) with many elements from later Mario releases such as Super Mario Bros. 3, Super Mario World, Super Mario World 2: Yoshi's Island, and Super Mario 64, however while the main characters and villains are 3-dimensional, most of the lesser enemies and objects are pre-rendered sprites on 2-dimensional backgrounds, resulting in a 2.5D effect. As in past games, Mario can collect coins, stomp on enemies, and grab Super Mushrooms from blocks, causing him to grow into "Super Mario", as well as getting a Fire Flower to turn into "Fire Mario". Unlike other games in the Super Mario series, such as Super Mario Bros. 3, Super Mario World, and Super Mario 64, flying is not a critical aspect in this game. The design of the world map is also similar to Super Mario Bros. 3 and Super Mario World. Many traditional moves from Mario's 3-D games reappear in this 2-D Mario adventure, including the ground pound, triple jump, and wall jump. Some enemies have also been carried over, such as Petey Piranha, and so have helpful characters such as the blue Loch Ness-style monster from Mario 64.